We act as credit brokers and we are not a lender. †Includes £752 Deposit Allowance Paid By Manufacturer. *Excess mileage charge of 8p per mile. If you exceed this annual mileage then excess mileage charges will be applied by the finance provider at the end of the agreement should you choose to return the vehicle. Finance subject to status. A guarantee may be required. Terms and conditions apply. Unless otherwise stated, metallic paint at extra cost. Library image for illustration purposes only. Initial payment of £984 +VAT followed by 35 monthly payments of £164 +VAT . Based on 10,000* miles per annum. *Excess mileage charges apply. If you exceed this annual mileage then excess mileage charges will be applied by the finance provider at the end of the agreement should you choose to return the vehicle. Finance subject to status. A guarantee may be required. Terms and conditions apply. Unless otherwise stated, metallic paint at extra cost. Library image for illustration purposes only. Renault's little Captur Crossover model aims to deliver a blend of the character and ruggedness of an SUV, the space and practicality of an MPV and the dynamics and driving refinement of a family hatchback. That's asking a lot, but this Clio-based design delivers plenty, with some genuinely clever interior touches and no small dose of style, plus some super-economical engines like the TCe90 unit featured here. If you're a volume brand these days, you simply have to offer a 'B'-segment supermini-based Crossover SUV. 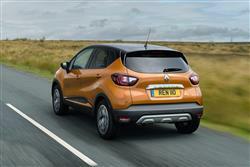 Here's the one they all have to beat: Renault's Captur. In recent times, it's been improved with smarter styling and an upgraded interior, while tech-savvy folk will want to know about the R-Link infotainment package offering 'Android Auto' smartphone-mirroring. And the option of a thumping BOSE premium sound system. 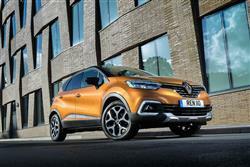 But will that be enough to ensure continued sales success for this little SUV? Let's put this car to the test in base TCE 90 petrol form and find out. 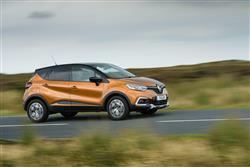 Very little's changed with regard to the driving experience of this Captur, but Renault argued that very little needed to. To some extent, we'd agree with that. Thanks to an 'understeer control' system and 'Roll Movement Intervention' technology, this Renault handles the bends quite eagerly. Not so good is the rather firm suspension set-up, which crashes over larger bumps but does more comfortably settle down on faster flowing roads. As before, almost all customers will choose a 90bhp model - ether the popular 1.5-litre dCi 90 diesel or the three cylinder 0.9-litre Tce 90 petrol unit we're looking at here. 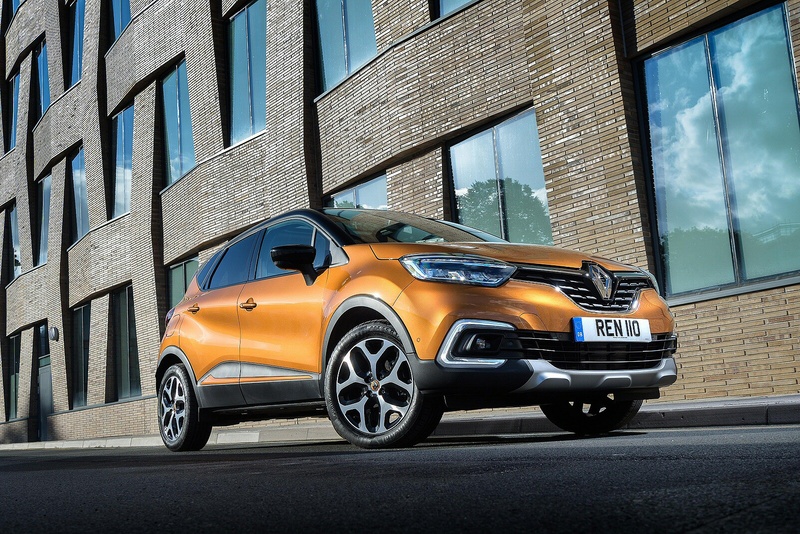 Unless you really require the dCi 90 unit's lusty 220Nm of torque, the revvy 0.9-litre three cylinder Tce 90 petrol powerplant could actually be all that's necessary for satisfying urban-based Captur ownership. Yes, eager progress in a Tce variant does entail more work with the light-shifting 5-speed gearstick than would be the case in a dCi, but ultimate performance is pretty much the same. Both engines get from rest to 62mph in a fraction over 13 seconds en route to a 106mph maximum. The styling's certainly a great deal more eye-catching than that of the Clio supermini this model's based upon, especially at the front where these days, C-shaped LED lights feature as part of headlamp clusters that can be specified to incorporate full-LED 'Pure Vision' beams. Behind the wheel, you get the all-important raised seating set-up that Crossover buyers like so much, the Captur positioning you 10cm higher than you would be in the Clio supermini it's based upon. Look around and if you happen to be familiar with this car in its original form, you should notice a classier ambiance with upgraded materials and, we reckon, better standards of fit and finish from the Spanish factory. 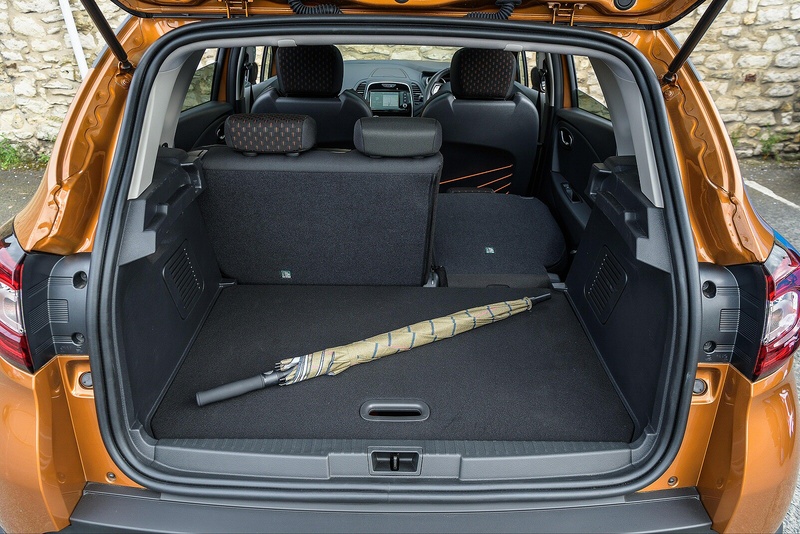 In the back, the stretching that's taken place on the Clio supermini platform has released enough space to make the back seat pretty much as roomy as it would be in a Focus-sized family hatch. 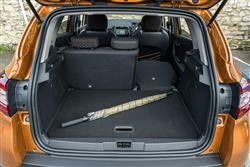 All variants get a pretty unique feature in this class, a sliding rear bench that moves backwards or forwards by up to 160mm (though only as one unit), enabling you to prioritise either legroom or bootspace. Out back, there's a 377-litre boot, exendable to as much as 455-litres if you push the bench forward. 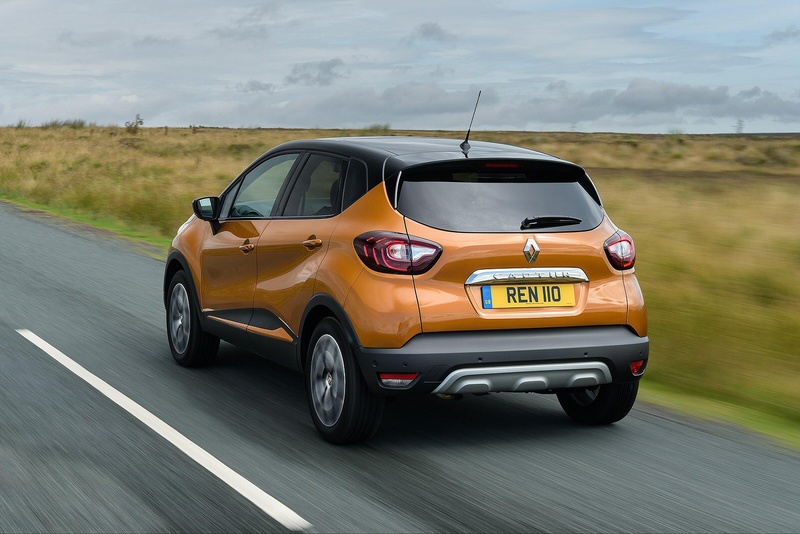 Originally, the Captur was one of the most affordable small SUVs available, but since launch, Renault has gradually tried to move its price up-market. It's still possible to get an entry-level TCe 90 model for under £15,500, but the rest of the range is now priced much higher, with plusher TCe 90 variants priced up to around £18,500. There's no 4WD option. 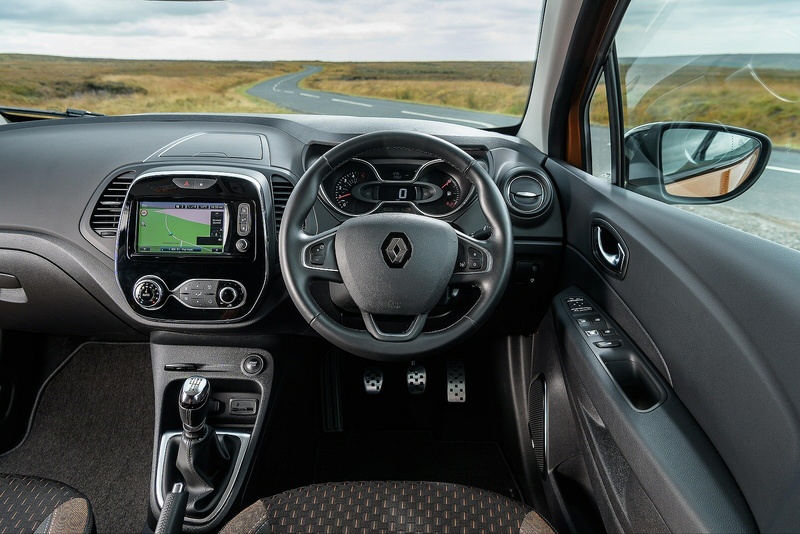 These prices represent a premium of between £1,400 and £1,800 over equivalently powered and specified versions of the five-door Clio supermini upon which Renault has based this car. There are three trim levels - 'Play', 'Iconic' and 'GT Line'. Equipment-wise, virtually all models get air conditioning and front foglights. And absolutely all of them get alloy wheels, daytime running lights, cruise control with a speed limiter, a trip computer, a height-adjustable driver's seat, power front windows and mirrors, Bluetooth 'phone compatibility, a decent quality USB and AUX-in-compatible CD stereo with fingertip control, plus Hill Start Assist to stop you from drifting backwards on uphill junctions. Popular options include the R-Link infotainment system with its downloadable apps. 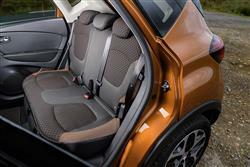 And removable, zip-fastened seat covers. The Captur delivers a set of impressively economical running cost figures. This TCe 90 petrol unit is perhaps the most interesting powerplant option, a three-cylinder 899cc petrol engine that manages to return 55.4mpg on the combined cycle and emits just 114g/km. The returns I've quoted for this car assume that you've activated the 'ECO' mode, accessible via this button on the centre console. This delivers fuel savings of up to 10% by slightly restricting the engine's pulling power, adopting a more efficient control programme for the air conditioning and heating systems and, in the case of EDC automatic models, switching to more efficient gearchange software mapping. Another strong buying incentive is the comprehensive warranty. Instead of the limiting three year/60,000 mile package you get with many rivals, there's coverage for up to 100,000 miles - and in the first two years, there's no mileage limit at all. 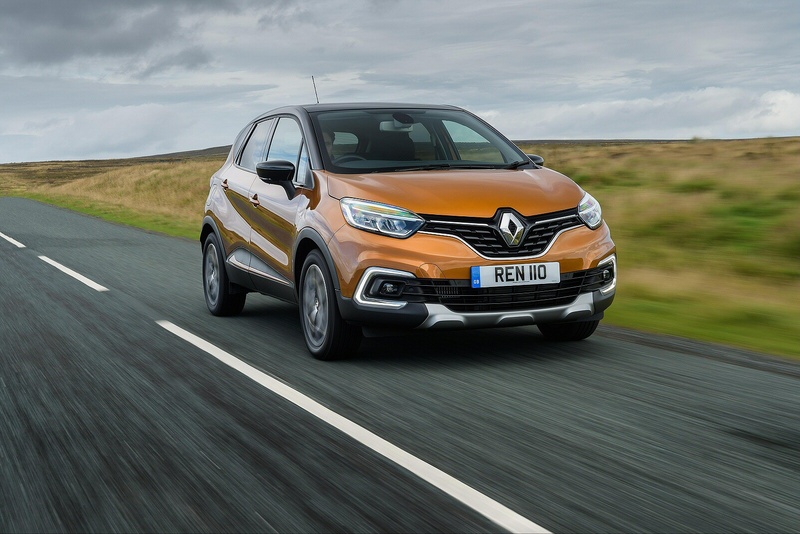 This warranty comes as part of the 'Renault 4+' package that the brand offers on all its models, a deal that for the four year period also gets you AA roadside assistance and free servicing (excluding wear and tear items). Overall, the brand reckons that the '4+' initiative will save buyers around £1,000 in ongoing costs. 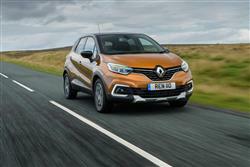 If you�re looking for a new Renault Captur 0.9 TCE 90 Iconic 5dr Petrol Hatchback for sale, you�ve come to the right place. 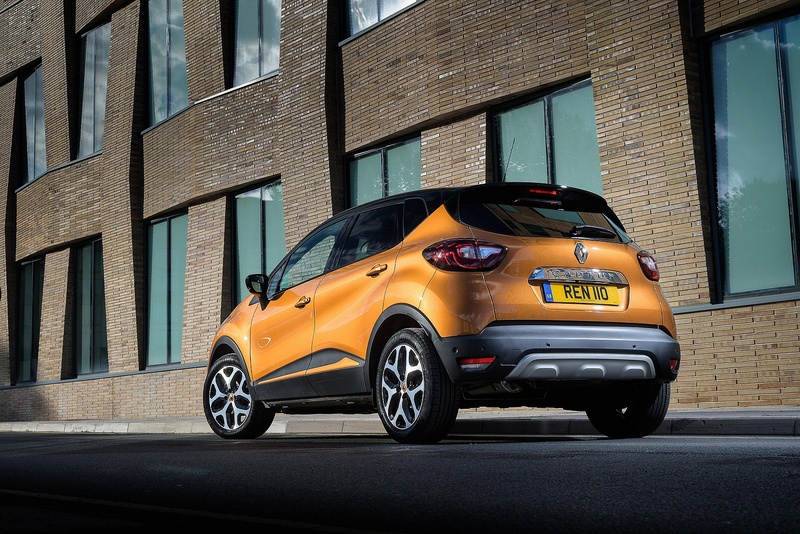 At Bristol Street Motors we don�t just have the best Renault Captur 0.9 TCE 90 Iconic 5dr Petrol Hatchback deals, we also offer friendly advice and help with all your enquiries to ensure your buying experience is a happy experience.